There are mainly three kinds of productivity labeled in the office and two of those are NOT desirable by any sane employer. One is the unproductive bunch which refers to employees who wander around not doing what they are supposed to do, not engaged in any productive activities, more of seat-warmers but they not posed any threats to the company’s goals and objectives. It’s not very hard to spot these unproductive lots; all you have to do is to look for the people who know exactly what part of them needed change to be more productive but they just refuse to do so. Another undesirable group of employee is the counterproductive mix. This group of employee displays counterproductive work behavior, which refers to actions by employees that go against the goals and aims of their employer. There are numerous and broad driving forces to counterproductive work behavior such as environmental reason, training deficiency, harsh and harmful personality and many other external factors. The only group that a company wishes it had is the productive one. Robinson and Bennett (1995), “A Typology of Deviant Workplace Behaviors: A Multidimensional Scaling Study”, they categorize workplace deviants into four categories, production deviance that involves tardiness or goldbricking, property deviance such as theft or sabotage of equipment, political deviance for example gossiping or favouritism and personal aggression which includes physical aggression, sexual harassment and work bullying. Counterproductive work behavior is not straight up corrupt or illegal behavior, but it exists in varying degree in many companies. If these behaviors are not being handled appropriately by the managers involved, a company might face a bigger problem that could potentially have negative impacts to their business. If we look at the above category, production deviance can easily be identified by using attendance software; attendance data from the software can accurately point out who had been slacking in time management and with the same data, a company can identify the attendance pattern of each employee. Tardiness is not only limited to those who come late to the office. In the minds of many workers, as long as they don’t check in late, tardiness has nothing to do with them. But when using advanced automated time attendance software like TimeTec, the definition of tardiness is wider than manual attendance could ever cover. Coming in late from breaks, miss punches, leaving from work early, leaving the office to do errands, unnecessary overtime and etc are considered tardiness and these deviant behaviors can be accurately traced by modern attendance software. Tardiness is not only limited to those who come in late for work. 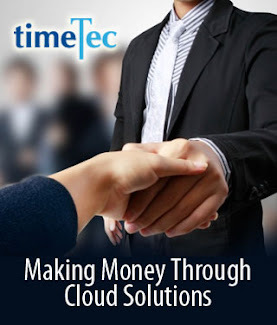 Trace employees tardiness using TimeTec for better workforce management. Goldbricking is another deviance that inflicts employees at work but the perpetrators are not as easy to spot. Who are these goldbrickers, how to identify them? They are those who contribute less but always pretend that they are busy with work when actually they are not doing much. Some like to be seen as using the Internet vigorously as if they are deep in their task when in fact they are just cyberslacking. 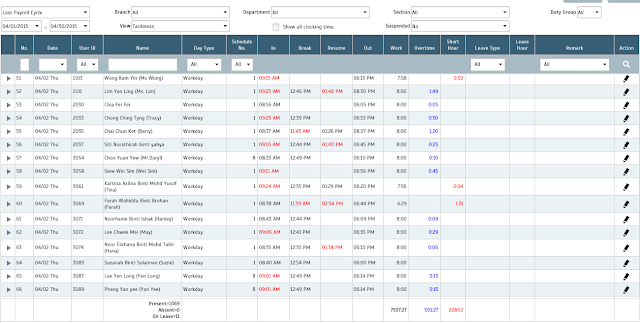 How to identify goldbricking activities using time attendance software? One way is to use job cost feature to combat this counterproductive work behavior. Job cost is a feature that times an employee on a certain task/project and it can be linked to a certain cost to monitor the progress and to manage the overall costing. With job cost, a company can highlight those who do not contribute sufficiently and in turn find a solution to counter the problem. 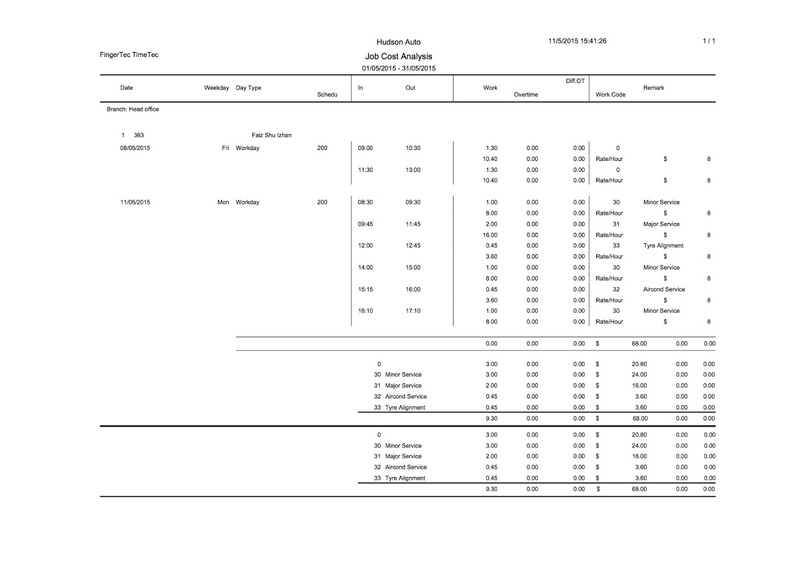 Job costing option is available for flexi working schedule to allow the management to monitor and manage costing. 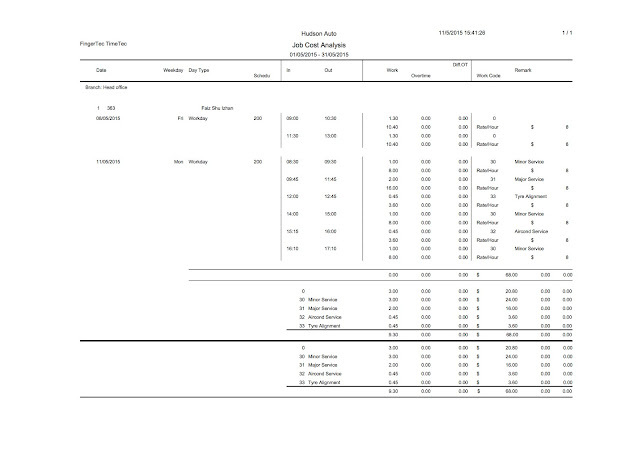 Example of job costing analysis report generated in TimeTec. Countering counterproductive work behavior is not only about changing the behavior of the staff, a company needs to create a work environment that has fair and equitable policies, which simply means everybody is subjected to the same rules, providing an even playing field. When employee perceives that everybody has to abide by the same rule, everybody’s engagement to perform better in the office could improve. For example, if the policy of the company states that the time allowance for check in is 15 mins, those who come in after that 15 mins must have the tardiness recorded and if the tardiness exceeds a certain level, it has to be punishable. A manager can’t commit the same tardiness and not be reprimanded. The staff must not feel that the company is playing favorites with some employees. Having an advanced automated attendance system can accomplish fairness in implementation of the rules and compliance where each employee is subjected to the same attendance policies and procedures imposed by the company in the system. Positive staff perceptions toward an organization often hold the key to preventing counterproductive workplace behavior from blossoming. Tardiness are highlighted in red and short hours are indicated for easy reference. The automated time attendance system also can allow employees to have a say in their work activities, providing employees with perceive ownership in their job responsibilities and transparency in their time activities. 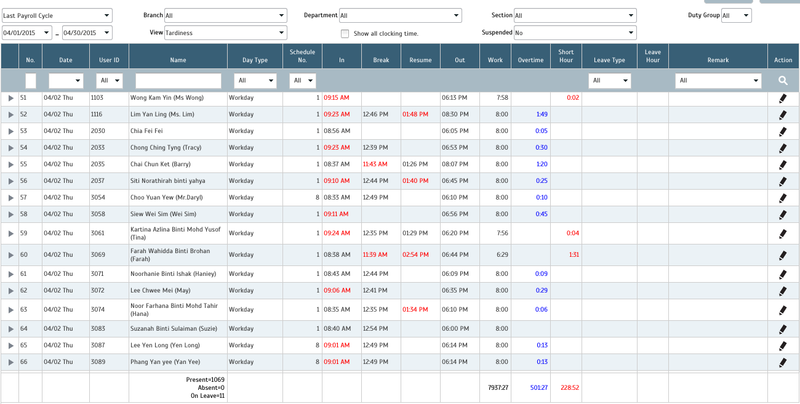 Employees can view their attendance data and if discrepancies found, meet the person in charge for explanation. When feasible, managers can also change up employees daily routines, challenge them with new projects or encourage them to improve the work they currently produce. Managers also play an important role in identifying counterproductive work behaviors. Managers need to be firm and stern in combating counterproductive work behaviors. They need to stress the importance of having positive work environment to ensure the success of a business, and do not lose the authority they have on their employees. Managers who have casual attitudes toward these deviant behaviors will not be able to eradicate this unwanted behavior because those who commit these counterproductive work behaviors sense and gauge the response of their superiors and they prefer those who do not react. By looking at the attendance data, if a company finds out that a few employees have started a “tardy” routine for a duration of time, remedy needs to be taken to correct the behavior by relevant managers. Installing a biometrics door access and time attendance hardware plus a few cameras can also be a solution to overcome property deviance and personal aggression because the data could tell who were in the space(s) during the time of the case occurrences. 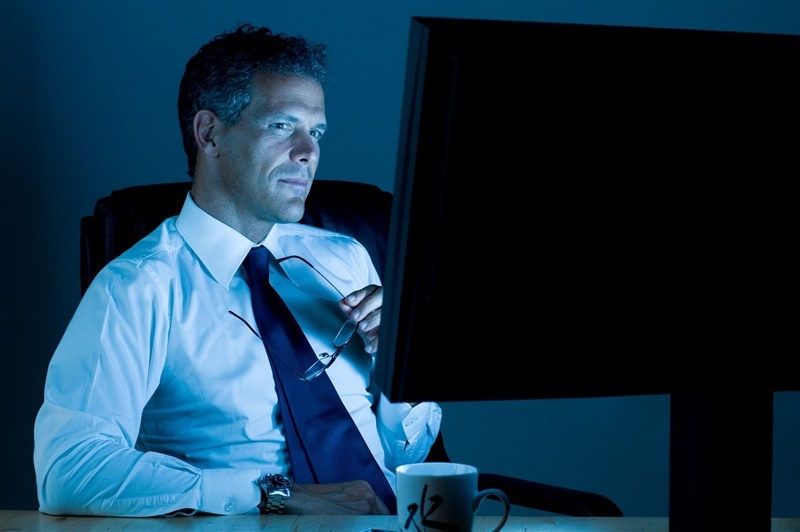 Counterproductive work behaviors come with a price tag and it is unwise for any organization to keep a close eye on this prevalence. These behaviors cost America businesses approximately $50 billion annually and may account for as many as 20% of failed businesses (Coffin, 2003). The deviances are various, they can be employees who start negative rumours about the company, employees who make long-distance calls or mail personal packages from work, employee who goes against boss’s decision or a boss who shows favouritism to particular employees, those who withhold information from the company and many more. 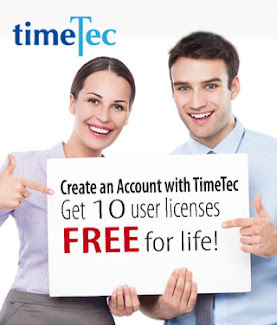 Automated time attendance system such as TimeTec can be used as a tool to eradicate these counterproductive work behaviors by systematically capture employee’s attendance and work activities, This time data is very useful for human resource to analysis to find a way to tackle the problem for a better future.